Not just a garnish, microgreens are so much more! 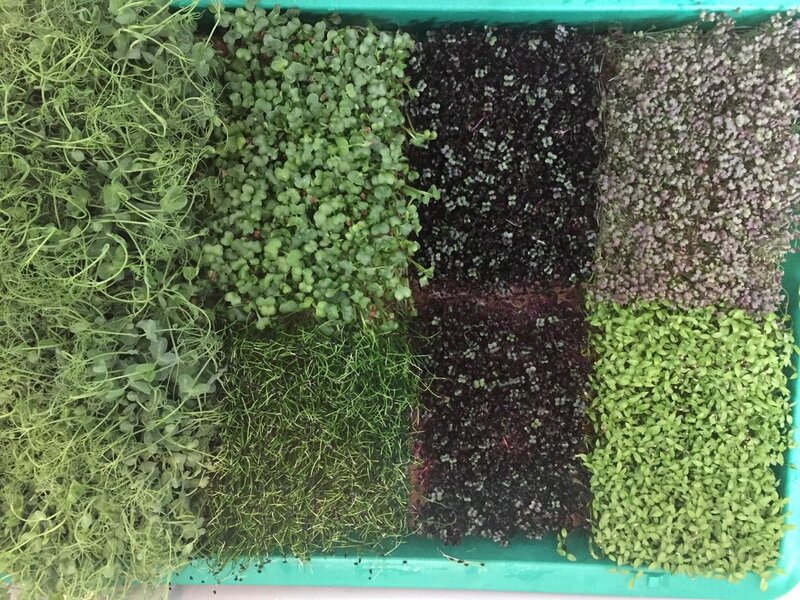 Microgreens have gained popularity as a new culinary trend over the past few years, and you may have seen them topping off an entree, making it look pretty. But what are these tiny greens? They are power houses of nutrition and flavor! recent research has discovered that these seedlings are four- to 40-fold more concentrated with nutrients than their mature counterparts. Wow! because as you may know, as soon as we harvest a plant it starts to lose some of it’s nutritional value. That’s one important reason to buy local and to grow some of your own food if possible. The flavor is also concentrated, meaning a little goes a long way to add that special taste to any dish. At Green Spirit Living Farm, we are committed to providing you with the best, freshest microgreens possible. We use only pure water, no fertilizers, pesticides, or soil. Grown and delivered (still growing) in food grade trays - the living difference! Learn more about microgreens and Green Spirit Living Farm. Get fresh microgreens weekly through our CSA with convenient local pick up locations. Creative ideas and recipes to get the goodness of microgreens in your diet.